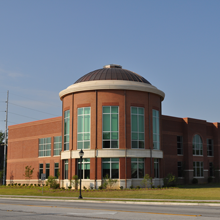 Greenwood County Library System in South Carolina, which includes three branches and a travelling bookmobile, aims to help its nearly 70,000 citizens be more connected, informed and entertained through free access to library resources, programs and services. In response to patron demand for more digital content, the library system purchased a digital magazine platform so users could read their favorite magazines on a computer or mobile device. In January 2016, after a year of low circulation and user frustration with its first digital magazine service, Greenwood County Library made the switch to EBSCO’s Flipster product. Within the first few weeks of launching and promoting Flipster, the library saw a dramatic increase in both digital magazine circulation and patronage, registering more than 400 new library card holders in the month of May alone. When Taylor attended the South Carolina Library Association conference in October 2015, she saw a demonstration of Flipster at the EBSCO booth. Greenwood County Library began subscribing to Flipster in January 2016. Taylor said she was pleased by the wide range of magazines available. She started off with 28 magazines including Rolling Stone, Vogue, Cosmopolitan, Car & Driver, O Magazine, People and Southern Living. In addition, the library subscribes to a number of children’s magazines through Flipster, including Ranger Rick and Cricket Media titles such as Babybug, a board book for babies and toddlers. Taylor said she had to cancel her print subscription because it was expensive, and the books kept coming back with “little bite marks on them” from teething babies. Accessing Flipster is easy; all a patron needs is a library card and an internet connection. A carousel of featured magazines scrolls across the bottom of the library home page and on the Digital Library resources page. Clicking a magazine cover image prompts users to log in, and then takes them right to the digital magazine of their choice. To further promote Flipster, Taylor distributed flyers, made announcements in the library’s computer classes, and advertised in the local newspaper and on local radio. “We have a contract with one of the radio stations here in town, and we got them to advertise it for us,” she said. Since launching Flipster in January 2016, the library has seen a marked increase in magazine circulation. In the first six months, Flipster logged more than 1,300 online views. In addition, library patronage is on the rise. Taylor has observed patrons sitting on the library steps or at picnic tables across the street, using the library’s wi-fi connection. In May alone, more than 400 new people signed up for library cards so they could access Flipster. The ability to access magazines digitally has also been beneficial to elderly patrons, many of whom aren’t as mobile as they once were. One elderly patron, Taylor said, used to depend on her daughter to pick up items at the library for her because she was not physically able to do it herself. Another woman who has had some health issues called the library to say that she was glad she could read Cosmopolitan and Vogue online. In the coming year, Taylor plans to add more magazines to her Flipster subscription. She said she would like to include a few niche titles to serve the area’s wrestling enthusiasts and those interested in hobbies such as quilting and genealogy.